At a time when college tuition is rising rapidly—particularly at the nation’s private colleges and universities—students and their parents face the question of whether a more expensive education leads to greater returns later in life. The answer given by those who have graduated from college is that their feelings of personal satisfaction and economic well-being are about the same, no matter which type of institution they attended, according to a 2013 Pew Research Center survey. Majorities of each group were satisfied with their family life, financial situation and current job. There were no statistically significant differences between the two groups on any of those three measures on overall satisfaction, though private school graduates were somewhat more likely than public school graduates to say they were “very satisfied” with their personal financial situation (44% vs. 34%). A survey conducted by Gallup and Purdue University earlier this year, coming at the question a somewhat different way, found that the type of institution the student attended—public or private, selective or less selective—mattered less to their workplace engagement and well-being later in life than the experiences they had while they were in school, such as having an encouraging mentor or participating in an internship or work experience related to classroom learning. In the Pew Research survey, both private and public college graduates were likely to say that their education was worth what they and their family paid for it. Roughly equal shares of 83% among private school graduates and 86% among public school graduates said they had already seen a payoff. Small shares of each (5% of private graduates and 7% of public graduates) said they expect to see their educations pay off in the future. The remainder said it will not pay off, or they are not sure. Graduates from private colleges were somewhat more likely to say their education was useful in preparing them for a job or career than graduates from public colleges (61% of private college graduates said it was very useful, compared with 51% of public graduates). Yet they said it took them about equal lengths of time to find the type of job they wanted after graduating. Slightly less than half of both groups (42% of private school graduates and 46% of public school graduates) said they found a job while still in school or almost immediately after graduation. The Pew Research survey found that graduates from private colleges were more likely to say they took out loans to finance their education than public college graduates (56% vs. 47%). A recent analysis of Department of Education data from the New America Foundation finds the same pattern among recent college graduates. Among adults who completed a bachelor’s degree at a private, non-profit school in the 2011-2012 school year, 74% took out loans to pay for college. 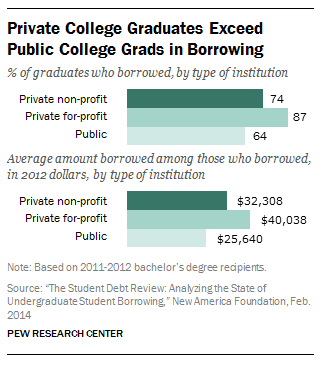 The share who borrowed was even higher among graduates of private, for-profit colleges (87%). By comparison, only 64% of public college graduates took out student loans. Bachelor’s degree recipients from private schools graduated with higher average debt than those with four-year degrees from public schools. A typical private non-profit college graduate in 2011-2012 who borrowed to complete their education graduated with $32,308 in loans (those graduating from private for-profit colleges owed even more, at about $40,038), compared with $25,640 among public university graduates the same year.